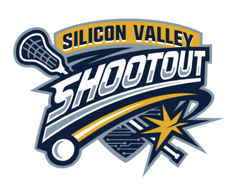 U.S. Lacrosse rules for the different age groups will be used on the field at the Silicon Valley Shootout unless otherwise stated here. Print them from the U.S. Lacrosse website or bring your rule book with you. Home team (listed first on the schedule) will wear white jerseys. The away team will wear their dark jerseys. All Games are 22 minute running time. A central clock will be used and an air horn will signal the start and stop of halves. Time will not be kept at the field. There is no bonus time for injuries or stoppages of play during a game. All substitution is done on the fly and there will be no horn during dead balls. Overtime will not be played in Pool Play. A tie score at the end of regulation will be recorded as a Tie for both teams. All Playoff and Championship Games that end regulation time in a tie will, after a 5 minute rest period, have a 5 minute Sudden Death Overtime..
No timeouts in Pool or Playoff games. Standings are determined by using 2 points for a win, 1 point for a tie and 0 points for a loss. Tie in standings tie-breakers. In bracket play 2 points for a win, 1 point for a tie and 0 points for a loss. Head to head results if a two -way tie. Both coaches and referees must agree to the final score and sign the scorecard at the end of each game. In cases of dispute, the decision of the Tournament Director will be final. Players are rostered by age group/birthdate and not by grade year for youth and middle school. All HS players must play in the HS Division, unless approve by the Tournament Director. Penalties: Personal fouls will result in a 60 second EMO situation. Technical fouls are 30 seconds, running time. The 'No Take-Out Check Rule' will be enforced. Zero helmet to helmet or body to helmet checks permitted. Expulsion: Officials report on the scorecard the name and the number of any player expelled for fighting. The player is suspended for the remainder of the tournament. Use Of Ineligible Or Illegal Players: A team whose opponent has used an ineligible or illegal player should report the incident to the director. Teams in violation will forfeit that game. All standard U.S. Lacrosse rules, including misconduct (yellow and red cards) apply. For HS players and teams, there is no player sharing, with the exception of goalies. All players can be rostered for only one team for the duration of the tournament. Any player caught playing on more than 1 team in the tournament will be barred from the remainder of tournament, and the team using the players will forfeit all games where the offending player participated. In the case of a Championship game, any instance of player sharing will result in the game being terminated immediately and forfeit by the offending team. If a team does not have enough players to play a regulation game, they may borrow players from another team or the opposing team. The game will count as a Loss for the team borrowing the players. A team loaning players is not affected and may accept their player(s) back at any time. This does not apply In a playoff or Championship game. All players wear full equipment. Goalie in full regulation protective gear, with goalie stick. Game played on one third field with full size goals. Full crease. Face-off to begin game, all other field players at least 8 meters away. No Long sticks. Goalie may use goalie stick. 22 minute running game time, clock kept on scoreboard on field. 8 minutes between games. After goal, goalie gives ball to teammate on GLE, and then referee blows whistle to restart play. Opposition players must retreat to midfield line. No constraint on location for any players at any time. No passing rules or constraints. No 20 second rule. Ties allowed in Pool play, sudden death overtime period in playoffs. All substitutions on the fly. No timeouts (injury moved to sidelines ASAP), no compensating time. All other normal NFHS rules apply. All players wear helmet and gloves. Game played on one sixth field with one 4’ by 4’ goal. Partial Crease. Teams flip coin to begin game, and winning side gets ball at the top of the restraining line and possession. After goal, opposing team gets ball above restraining line and restarts play. Change of possession requires team on defense to get ball and clear it with full possession to above the restraining line (if player goes out of bounds prior to regaining possession or makes an unsuccessful pass that goes beyond restraining line, then possession does not change). No passing rules or constraints. Penalties on the offense result in a change of possession. Penalities on the defense result in a Penalty Shot for the offense. All players wear goggles and mouth guards. Goalie in full regulation protective gear, with goalie stick. Game played on one third field with full size goals. Draw to begin game, all other field players at least 8 meters away. All players wear goggles and mouthguards. No Goalie. Game played on one sixth field with two full size goals. Rejector net in cage in place of goalie.